The number of teenagers killed violently in the UK fell this year to 51 from more than 70 in 2008, BBC research has found. After warnings of growing gang culture in the UK, does this mean the authorities are winning the war against gun and knife crime? 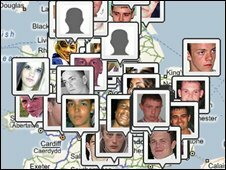 In the summer of 2008, newspapers spoke of a knife crime epidemic as a spate of fatal stabbings left more than 20 teenagers dead within three months. By the end of the year, BBC News website research - published on a database - showed 72 young people between the ages of 10 and 19 had lost their lives to violence. At the time, politicians queued up to condemn gang culture and to promise tougher measures against those who wielded blades. One year on, and our records show the number of young victims of homicide - including murder and manslaughter - has dropped by 30% to 51. British Crime Survey statistics released earlier this year also appear to support the BBC's findings. The official figures showed a fall in the number of homicide offences involving a knife or other sharp instrument from 270 to 252 between 2007/08 and 2008/09. However, because the number of homicides dropped, the proportion of killings involving a sharp instrument actually rose from 35% in 2007/08 to 39% in 2008/09. The BCS also recorded a rise in the number of attempted murders involving a knife - up from 245 to 271. But knife crime czar Deputy Chief Constable Alf Hitchcock believes the fall in teenage homicide is a sign progress is being made. "This shows us we are heading in the right direction, but there is no room for complacency," he says. DCC Hitchcock argues the Tackling Knives Action Programme, launched in June 2008 at the height of fears of growing gang culture, is part of the reason for the fall in deaths. The multi-million-pound venture, which now involves five government departments and 16 police forces, not only focuses on high-visibility policing, but also education, after-school activities and support for parents. DCC Hitchcock acknowledges policing alone cannot tackle youth violence, and says that through working together, the authorities have become more adept at spotting the young people most at risk and the social factors that lead them to violence. Yet, the police chief warns that although violent teenage deaths are currently down, the battle against knife crime is far from won. "Whatever government is in power next year needs to continue this work," he says. "Policing is the short term, but this is a generational issue." And our database shows young people are continuing to lose their lives. Of the 51 young people recorded as dying violently this year, the youngest was just 10 years old and the oldest 19. The most common ages of victims were 17 and 18. Most of those suffering a violent death were white and male - just nine of the 51 were girls. Half died as a result of stabbings, while 12 were beaten and two were shot. While England saw the vast majority of cases, Scotland had eight, Wales three and Northern Ireland two. Of all cities, London had most deaths - with 13 of its teenage residents losing their lives to violence. However, this is a significant drop from 26 in 2007 and 29 in 2008. The only other cities to see more than one teenage homicide this year were Nottingham (three), Glasgow (two), Manchester (two) and Liverpool (two). But these are not just statistics. Each number represents a life cut short - something Delroy Elliott knows only too well. His 17-year-old son, Anton Hyman, was stabbed, shot and dumped in a river in west London in 2004. Mr Elliott, like DCC Hitchcock, believes tougher, more high-profile policing and stricter sentencing are part of the reason deaths are down. The minimum term for knife murders has increased from 15 to 25 years. "The police stopping and searching and being more forceful in their application has put a bit of fear in them [young people] - there's a bit more of an edge," Mr Elliott says. Although he backs this tough police stance, he believes it must be accompanied by stronger relationships with communities - as well as preventative education. To this end, Mr Elliott visits schools, colleges and prisons to talk about the impact of violence on families and says this has a profound effect on those listening - even young offenders. "They [listeners] hear it from the heart. We need more of that and more victims to step out and do that," he says. This is something Barbara Dunne, founder of campaign group Mothers Against Knives, has also found when she speaks of the death of her son Robert, killed in 2003 by a teenager wielding a samurai sword. Although her life remains "full of nightmares", she says talking to young people - even those of primary school age - about the consequences of violence is essential. Yet, while she says the fall in deaths may be a "positive sign", she believes it is not yet possible to tell whether the drop in deaths is down to successful measures to prevent young people turning to violence. Mrs Dunne even suggests the fall could be just the result of a number of the ringleaders being in jail. "It could be an awful lot of things," she says. Richard Garside, of the Centre for Crime and Justice Studies (CCJS) at King's College London, also believes it is not yet possible to assess whether gun and knife crime is decreasing. He also questions whether police-led measures, such as the Tackling Knives Action Programme, can ever have any long-term effect. CCJS research earlier this year suggested a zero-tolerance approach to weapon possession and stop-and-search tactics had little lasting impact on knife crime and young people's attitudes towards it. "These measures are not addressing the underlying causes of the problem," he says. Yet, while the BBC database is a reminder that violence plays a part of the lives of many teenagers, DCC Hitchcock is keen to point out they remain in the minority. "It is a very small number. The vast majority of young people are good citizens," he adds. Is knife crime as common as we think?